OK, So we never saw that one coming……. Regatta have done the unthinkable, Improved the top selling, Regatta Dover Jacket. How? By adding the Regatta Dover Plus Jacket to the range! 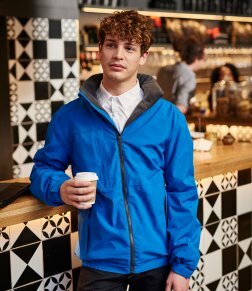 Fabric: The Dover Plus jacket features the Regatta Isotex® 10000 four way stretch polyester outer shell which is both waterproof & breathable. Concealed, detachable hood with adjusters. Full length front zip with inner storm flap and chin guard. 210 series anti-pill Symmetry® fleece lined body and collar. One tear release internal pocket. Colours: Currently available in Black, Navy & Oxford blue. So there it is! How you improve the perfect jacket! This entry was posted in Jackets and tagged Regatta Dover Plus, Regatta Jacket, staff uniform, workwear on 30th January 2018 by admin.